Lilypatch Stamps' image of a classic violin inspired me to step back in time. This stamp was graciously supplied to the Design Team at Tuesday Throwdown, so we could make some inspiration cards for the challenge. 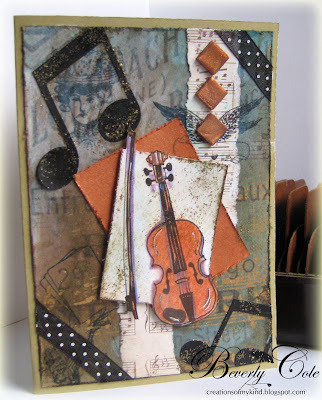 I used some Crafty Secrets stamps and Tim Holtz Craft Resist card stock to make this violin sing. I also used some paper from MME. I inked the Craft cardstock with Distress Markers in Picket Fence and Broken China. The mosaic tiles are from Mark Richards. The music notes were cut with my Silhouette. Ribbon from my stash. I used Distress Stickles to dress up the card with some bling. I love this!! Love the techniques you used and the Violin stamp is AWESOME!! Wonderful card Bev!! Hi Bev, I love the vintage feel of your card. it is really wonderful. Bev this is such a great card. I love the image and your papers.